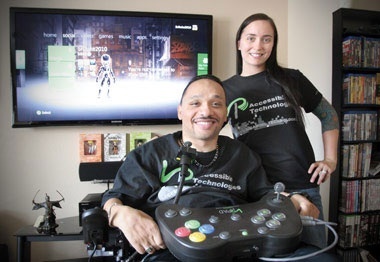 A Casa Grande man who is a former U.S. Border Patrol agent created and patented a video game controller for people with severe spinal cord injuries. Luis Pena formed LP Accessible Technologies and created the controller out of necessity. He was injured in an auto accident on the job in 2007 and is a quadriplegic. His company focuses on building video game controllers that disabled people can use to play video games. A longtime video game buff, Pena missed playing games after he recovered from the accident. So, he set out to create a controller he, and other people with disabilities, could use. The result is the LP Pad, which Pena says is just like an Xbox remote control except for its size. It operates like a regular remote through Bluetooth technology and is fully compatible with the Xbox 360 gaming system. It weighs less than a pound and is made specifically to sit on the user’s lap. The controller features large buttons that are activated simply by brushing a hand across them. “People who are like me can only push with like three or four pounds of pressure,” Pena said. Or, users can plug a “chin stick” into the LP Pad, and they’re ready to play any video game made for the Xbox. Pena said he is working hard to get the controller available for use on PS3 gaming systems and hopes to have one developed within a year. For now, he is taking his controller all over the country to show people with disabilities how they can again enjoy playing video games. “I’m hoping eventually we can get a licensing agreement from Microsoft so we can sell these game controllers at a lower cost at Best Buy, GameStop, Wal-Mart, anywhere,” Pena said. Pena’s controllers sell for $399.99. The controller can be purchased at lpaccessibletechnologies.com. Oct. 18, 2007, is a date Pena will never forget, even though he still doesn’t know exactly what happened that day. He remembers going to the bank to open an account and was scheduled to work that night, beginning a “camp duty” in which agents stay in the desert for seven days. Pena’s been told he reported to work at the Border Patrol station in Casa Grande and was en route to back up another agent in the desert — but he never made it there. Investigators don’t know exactly what happened except that his vehicle rolled over while traveling through the Tohono O’odham Nation. “I was driving on a straightaway — you could see skid marks go right and come back left and then I rolled over,” Pena said. “The assumption is that perhaps cattle or horses got in the way and that’s what made me roll over. We’ll never know for sure.” Pena said he was strapped in and not ejected. Pena woke up a month later at University Medical Center in Tucson and was told he was paralyzed from the chest down after suffering a C6-C7 spinal injury. He said the doctors immediately sedated him after he woke up. “Knowing what my body looked like before — when I woke up and looked at my arms and saw the atrophy, I really freaked out,” he said. After his injury, Pena and his family lived in a hotel for eight months while renovations were be made to his two-story home, making it wheelchair accessible. An elevator was installed, his yard relandscaped and he was given a custom van that he still drives. Pena was officially retired from the Border Patrol in 2012, ending his nine-year career with Homeland Security. Prior to joining the Border Patrol, Pena was a police officer with the Amtrak Police Department in Philadelphia and helped in the aftermath of the Sept. 11, 2011, terrorism attacks in New York City. Before his accident, Pena was active in martial arts, a fourth-degree black belt in four different styles and also fought in mixed martial arts. Pena requires assistance from a caregiver, and after four years of help from Kaylin Winkelmann, he says she’s his best friend. Winkelmann is also Pena’s business partner in LP Accessible Technologies. Starting the company was a big step for Pena. “It’s hard not to get excited and at the same time we’re nervous because we spent so much time and money just trying to get the prototype pad working correctly,” he said. Pena and Winkelmann travel to hospitals, rehabilitation centers, trade shows and conventions to demonstrate the controller. “Everybody that has used it absolutely falls in love with it. There is nothing out there at all for people like us,” with spinal cord injuries, Pena said.